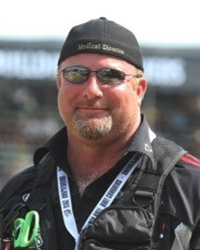 Rick Bahr is the founder, president, and CEO of WMI Global, LLC, which provides professional event risk management, safety, emergency, sports medical, and rescue services at major sporting events around the world. Bahr has served as the medical director at major sporting events worldwide, including Red Bull events and the Vans Triple Crown of Surfing Tour. Bahr develops and implements emergency action plans, disaster plans, medical operations plans, and rescue plans globally for large events, including world championships in an array of sports. Bahr created and teaches the Emergency Athletic Training course for the program. His company delivers emergency medical care to many extreme sport events around the world. He leads the on-campus residency portion of the program, where students will get hands-on experience in emergency preparedness through exposure to novel situations and conditions and adding an advanced triage skill set to the practicing athletic trainer. Additionally, he brings his wealth of knowledge and experience in trauma sports medicine to the classroom, where students will have the opportunity to learn through real-life case-based examples and discussions. This course is ideal for people who want to work in extreme sports and with elite athletes.